Whether you are fly fishing on some of the 800 miles of wild trout rivers in the Great Smoky Mountains National Park, or floating in the cool tailwaters of the Holston or Clinch Rivers or Chilhowee Lake, Blount County and the surrounding area is a fisherman’s paradise. There are several ways you can approach this. If you own your own gear and are familiar with the area, you can head out on your own. You need to buy a license and pick up a copy of the regulations, which you can do locally at several places. The National Park holds only wild trout. You will be catching rainbow, brown and native brook trout. In the National Park, only single hook with artificial lures are allowed. 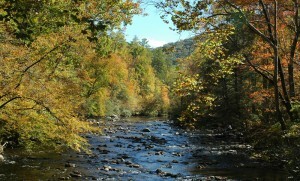 One of the nicer places is the Middle Prong of the Little River accessed from the road going up towards Cades Cove. You turn left on the road that leads to The Great Smoky Mountains Institute at Tremont. The Little River along the road from Townsend to Gatlinburg is also well populated with trout, with plenty of roadside access. If you are fishing in Townsend, outside of the National Park boundary, a trout stamp is required on your fishing license and regulations are different. TWRA, the Tennessee Wildlife Resource Agency, stocks the river with rainbow trout; you can contact them to find out when they are stocking. Fishing in Townsend can be a little tricky as most of the property in the Townsend area is private. You would be safe parking at the picnic area on the lower end of town going towards Maryville. I can also tell you a few other spots that I see people in the river fishing, but you will be on your own getting permission. If you have little time and want the most bang for the time you do have, hire one of the area guides like Ian or Charity Rutter at R&R Fly Fishing Smoky Mountain Guide Service. They are full time fly-fishing guides and have years of experience. Ian & Charity have written several guidebooks to fly fishing the Smoky Mountains and Tennessee. Their website is a font of information for daily updates, purchases, booking a trip etc. They will pick you up here at the bed and breakfast, leaving your car free for anyone who doesn’t want to spend the day fishing. Should your spouse decide to join you, it is only an extra $15 tacked onto their full day trips. Lunch is provided on all their full day trips. They don’t book more than two people per guide, for a close one-on-one experience. Even if you’ve never fly fished before and just want to try it for a day, you can rent gear for your guided day on the river and they will teach you all the basics from casting to landing trout. R&R Fly Fishing offers half day and full day wade trips in the Great Smoky Mountains National Park or full day float trips on some of Tennessee’s tailwaters. For more detailed information on the trips they offer visit their website. A great store offering fly-fishing classes and daily fishing reports is Little River Outfitters, owned by Byron and Paula Begley in “downtown” Townsend. If this 7000 square foot store doesn’t stock it, I’d have to question, do you need it? Again, the website is a font of information. You can sign up for newsletters from both Little River Outfitters and R&R Fly fishing on their websites. 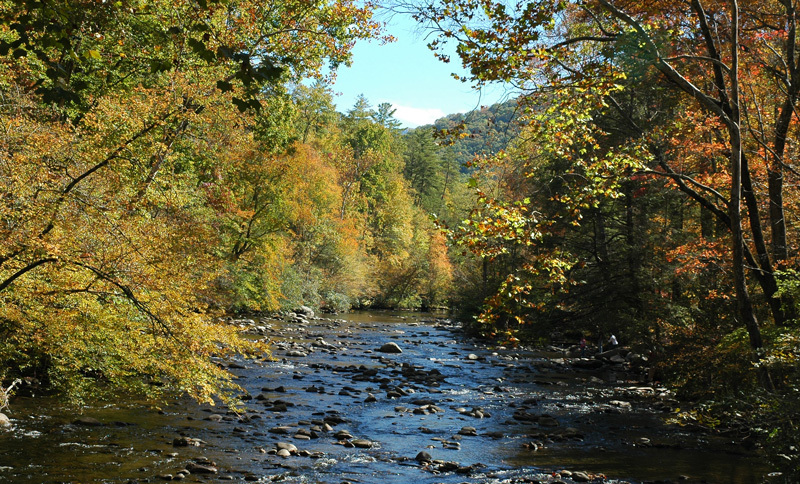 Each year the Little River Chapter of Trout Unlimited hosts TroutFest, in Townsend, a major fund-raiser that benefits trout stream preservation and restoration in the Great Smoky Mountains National Park. This year it starts with a banquet and auction on Friday, May 13th, 2011 at 6PM. Tickets are $50 and should be purchased in advance. On Saturday and Sunday starting at 9AM, there is an all-day fly-fishing exposition at the Townsend Visitor Center. It is one of the largest venues for fly anglers in the southeast United States. There are demos from fly tyers and free seminars by notable fly fishermen from across the country. Also exhibiting will be tackle manufacturers, fly shops, guides, artists, non-profit organizations and government fish and game agencies. Last year Little River Trout Unlimited donated $45,000 to the Great Smoky Mountains National Park Fisheries Department. This year they are printing a magazine chocked full of pertinent information, TroutFest Journal, which will be available at TroutFest for $5.00 and can be ordered ahead of time. The details on how you can order it will be ironed out about the time it comes off the press! Call Little River Outfitters at 865-448-3474 and they should be able to help you out. Happy casting!